Amy Stewart is a highly sought-after public speaker whose spirited lectures have inspired and entertained audiences at college campuses such as Cornell and the University of Minnesota, corporate offices, including the Google Author Series, conferences and garden shows, as well as botanical gardens, museums, bookstores, and garden clubs nationwide. You can also watch videos of Amy Stewart discussing her books here. To book Amy as a speaker, send an email to publicity@amystewart.com . And if we can't get together in person? There's another option! Go here to find out about arranging a 'virtual' meeting by phone or webcam. A special note about events for children: All of Amy's books, and her lectures and events, are aimed at an adult audience. While preteens and teenagers have attended and enjoyed her lectures, they are not geared for a youth audience and probably won't hold the attention of children. 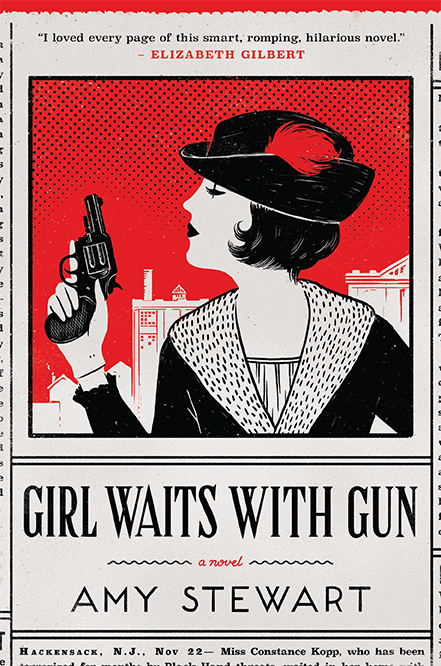 Amy Stewart's Kopp Sisters novels, starting with Girl Waits with Gun, are based on the true story of three extraordinary women: Constance, Norma, and Fleurette Kopp. In 2012, Stewart stumbled across a 1914 newspaper article about them and went on to uncover their amazing history through genealogical archives, court records, old newspapers, and interviews with family members. From their story, she is writing a series about the Kopp sisters and their adventures in crime-fighting. Stewart will share photographs and stories about these extraordinary women and the fascinating historical background that shaped their world a hundred years ago. Fresh Air's book critic Maureen Corrigan said that the novels "take readers on a lively chase through a lost world. It’s a colorful and inventive adventure tale that also contains a serious message at its core about the importance of meaningful work to women’s identities and, in some cases, survival." 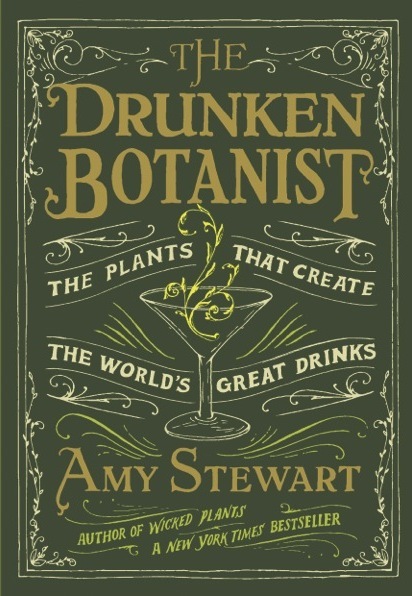 Author Amy Stewart is back with her fourth New York Times bestseller, The Drunken Botanist: The Plants That Create the World’s Great Drinks. Join her for an exploration of the dizzying array of plants that humans have, through ingenuity, inspiration, and sheer desperation, contrived to transform into alcohol. From the sugar cane that gives us Caribbean rum, to the juniper berries that flavor gin, to the odd and obscure fruits that flavor Italian liqueurs, Amy Stewart takes a most intoxicating perspective on the leaves, bark, seeds, roots, flowers, and fruit imbibed around the world. It's the compelling mixture of history, science, literature and humor that Stewart is known for. Edible gardening doesn’t just put food on the table—it puts a drink in your hand, too. Join Amy Stewart for a talk on designing a cocktail garden that does double duty as a productive space to grow edibles, and a location for your next party. We'll cover the most worthwhile cocktail-friendly plants to grow: Learn which variety of mint flavors authentic Cuban mojitos, discover patio-sized fruits for punches and smashes, and find out why growing your own celery for a Bloody Mary brunch is totally worthwhile. We'll look at examples of beautifully-designed cocktail gardens and outdoor bars, and innovative ideas for extending the season indoors. You’ll also learn secrets to mixing great drinks and creating your own botanical infusions. For all Drunken Botanist events: Although Amy's events do not include her performing cocktail-making demos or mixing drinks for a crowd, we can provide a list of cocktail recipes that are easy to batch ahead of time and serve during the event. Join Amy Stewart for a darkly comical look at the sinister side of our relationship with the insect world. In this talk based on her New York Times bestseller, you'll meet creatures that infest, infect, and generally wreak havoc on human affairs. From the world's most painful hornet, to the flies that transmit deadly diseases, to millipedes that stop traffic, to the "bookworms" that devour libraries, to the Japanese beetles munching on your roses, Wicked Bugs delves into the extraordinary power of six and eight-legged creatures. It's a mixture of history, science, murder, and intrigue that begins--but doesn't end--in your own backyard. This 45-minute talk is accompanied by dazzling photographs, historical images, copper engravings, and other visuals as illustrations. In addition, Amy may bring actual specimens with her-- but don't worry--they don't bite! Also: The Wicked Bugs Traveling Exhibit! Go here to find out about booking the exhibit at botanical gardens, science museums, zoos, libraries, and other venues. In her New York Times bestseller Wicked Plants: The Weed That Killed Lincoln's Mother and Other Botanical Atrocities, Amy Stewart takes on Mother Nature's most appalling creations. It's an A to Z of plants that kill, maim, intoxicate, and otherwise offend. Drawing on history, medicine, science, and legend, Stewart presents tales of bloodcurdling botany that will entertain, alarm, and enlighten even the most intrepid gardeners and nature lovers. Find out which plant killed Abraham Lincoln's mother, which shrub ignited a global war, and what plant has killed 90 million people. From strychnine to castor bean, from poison sumac to monkshood, from carnivorous plants to weeds that spontaneously combust, Stewart introduces an unforgettable cast of characters and tells their tales with her own wicked sense of humor. This 45-minute talk is accompanied by dazzling photographs, historical images, copper engravings, and other visuals as illustrations. Botanical gardens and other institutions can go here to find out about hosting a Wicked Plants exhibit. A one-hour discussion and slide show. Amy Stewart traveled around the world to learn more about the extraordinary business of flowers. At laboratories, greenhouses, airports, warehouses, and flower shops, she discovered a remarkable intersection of nature and technology, of sentiment and commerce. She told the story in her bestselling book, Flower Confidential: The Good, the Bad, and the Beautiful in the Business of Flowers. What has been gained, and what has been lost, in the quest for the perfect flower? Does it matter if roses have lost their scent? How do we respond to a lily that has been bred for the convenience of the grower, not the desires of the customer? Are we better off with 209 varieties of daisies to choose from? In a global marketplace, is there such a thing as a socially responsible flower? Join Stewart for an exploration of the individuals, the corporations, and the technology dedicated to the pursuit of the perfect flower. You'll never look at a rose the same way again. A one-hour workshop with slides. Designed as a workshop for mystery writers, but garden clubs and botanical gardens are also encouraged to partner with local mystery writers' groups, mystery bookstores, or mystery book clubs to host a joint event. Murder mysteries might be called “whodunnits,” but the “how” is every bit as important as the “who.” Mystery writers are always in search of a new way to kill off a character. Is there a poisonous seed that can be baked into a cupcake? A bitter herb that could be slipped into a cocktail? What about a stinging caterpillar with no known antivenin, or a beetle that provides the perfect alibi? The natural world is full of poisons, misleading clues, and dastardly characters. Based on her sold-out workshop for mystery writers at the Tucson Festival of Books, Amy Stewart has assembled a treasure trove of dreadful poisons and venomous stings from her books Wicked Plants and Wicked Bugs. She'll also share true crime stories from the natural world—from a serial killer who used the seeds of a tropical tree on his victims, to the world's most inept murderess, to a new twist on the ever-popular vampire story. It's an unforgettable and wickedly hilarious talk that will appeal to mystery writers and their fans! You've got a story to tell--but HOW are you going tell it? In this fun and fast-paced workshop, Amy Stewart encourages writers to go on a speed date with several different approaches to plot. You'll get to try out at least half a dozen techniques for analyzing and outlining your story, including new twists on tried-and-true methods, and some wholly original approaches that Stewart has developed herself. (And yes, one of them is inspired by the hit musical Hamilton!) This class works well for both fiction and nonfiction writers, and can be taught in as little as three hours or as much as two days.
" I got rave reviews about all the authors at yesterday’s event but none more than you. To say that you had an adoring audience is a significant understatement. The combination of your speaking style and those images was unbeatable. You developed a very loyal audience yesterday." 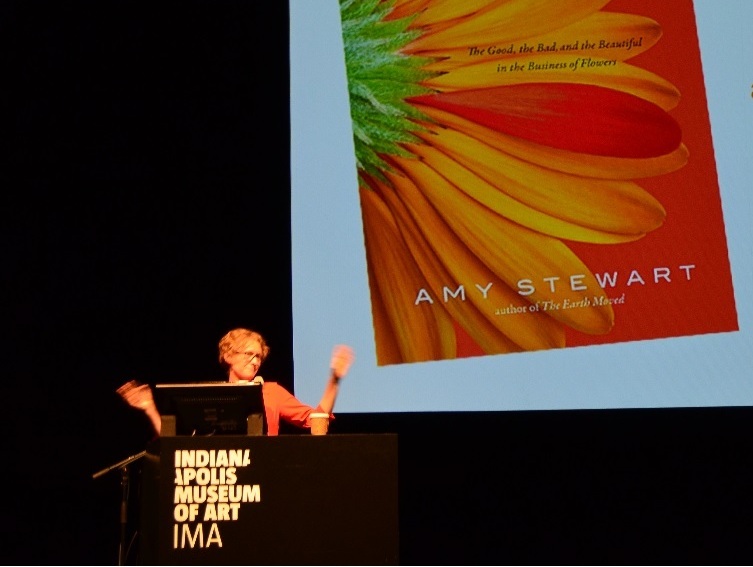 "Amy Stewart had our audience enthralled with her recent presentation at Books in Bloom. Smart, articulate and funny, her talk had it all, and with her recent foray into fiction, her appeal has broadened, making her truly an ideal guest author for any literary event. We've already heard from many delighted attendees who were thrilled to have been able to meet her and hear her speak." "We heard from tons of people that this year’s Spokane Is Reading was the best yet and it was because of Amy’s great book and her informative and entertaining presentation! Thank you Amy for inspiring so many people not just to read but to speak up to right a wrong like Constance Kopp did all those years ago. Awesome!" "People are still raving about your talk here in May. You certainly took Little Rhody by storm." "That was the best lecture I've ever attended--not just here, but anywhere!" "You are the best speaker I have ever heard here!" "Thanks so much for including the Arnold Arboretum in your speaking circuit. You gave a terrific lecture on Flower Confidential, communicating the subject with energy, clarity, and humor." "I can see why our committee was so eager to get you here! Thank you for the great event. We got so many positive comments! People would like to repeat it when you publish your next book!!!!" "Amy Stewart's recent appearance at Books & Books, in support of her newly released Flower Confidential, is still being talked about today. Her large audience made up of many prominent members of Miami's flower industry was charmed by the disarming way she told the story of how flowers are brought to market. She's funny, interesting, smart and not afraid to tackle any question head on; her audience ate it up. I can't remember an event at the store when almost everyone who came bought a book. Every author should be that effective a speaker!" "Thank you for taking time out of your busy book tour to come to our library to do your excellent presentation on your book. You brought the audience with you on your journey to learn about the flower business from its beginning to the current stage. The people who came to the program all enjoyed your talk. It was a pleasure meeting you and hearing you talk about something you seem to be very passionate about." "Wow! She is amazing...Provided great insights about writing; loved her presentation...Great presenter!" "Nice job on bringing Amy Stewart! There are so few "rock stars" in horticulture...Amy was an outstanding speaker--smart, funny, and oh, so engaging. Best Bonfils lecture EVER! I would love to hear her speak again... One of the best lectures I've ever attended. I'm already using the information." "Amy was the most fantastic, entertaining and interesting speaker we have ever had. We are still getting such rave reviews!" "In a word, it was great! It was a true joy to have you here and to meet you. The lecture was a hit, and the signing was a big success." "Fantastic! Delightful! Fascinating historic info. Amy is a great speaker and threw a lot of humor into her topic....Excellent, humorous, informed and informative, and eloquent."